Drew Anderson hit two homers to lead Ohio State to a 10-8 win over Clemson Friday afternoon at Plainsman Park in the opening game of the Auburn (AL) Regional. Ohio State improved to 42-19, while Clemson fell to 38-21. Buckeye lefty starter Josh Newman (8-5) allowed six runs in 6.0 innings pitched but still earned the win. Closer Matt Davis earned his 12th save of the year as well. Tiger reliever Jeff Hahn (5-7) suffered the loss. Clemson jumped out to an early 3-0 lead in the first inning. Russell Triplett reached on an infield single that he barely beat out on a head-first slide. After advancing to second on a balk, Brad McCann walked to load the bases. Then David Slevin laced a 1-2 curveball down the third-base line to plate two runs. 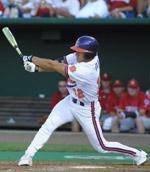 Slevin’s hit extended his hitting streak to 21 games, tied for 10th longest in Clemson history. Kyle Frank followed with a sacrifice fly to center to score McCann. Ohio State cut into the Tiger lead in the third inning on a two-out, two-run homer by leadoff batter Drew Anderson. It was his eighth homer of the year. Steve Caravati gave the Buckeyes a 4-3 lead in the fourth inning on a towering two-run homer just inside the left-field foul pole. Frank tied the score 4-4 when he hit a solo homer to right field in the fourth inning, his ninth of the season. The Buckeyes regained the lead in the fifth inning on a solo home run by Anderson, his second of the game and ninth of the season. The wind-aided homer just cleared the “Green Monster” in left field. Ohio State added an insurance run in the seventh inning when Mike Rabin blooped a two-out single to right field to plate Brett Garrard, who led off the inning with a walk. Christian Snavely then lined an RBI double to the right-field gap to give Ohio State a 7-4 lead. Clemson came right back in the seventh inning with two runs. Zane Green reached on a bunt single (the first leadoff batter to reach in the game) and Steve Pyzik followed with a single through the right side. Garrick Evans, who lined out to the outfield his previous two at bats, singled to right to score Green. After Ohio State retired the next two Tigers, McCann extended his hitting streak to 18 games with an RBI single through the left side to narrow the Buckeye lead to one run. Ohio State threatened to increase its one-run lead in the eighth inning when it loaded the bases with one out. But Tiger freshman reliever struck out Jedidiah Stephen and got Anderson to fly out to end the inning. Clemson then mounted a two-out rally in the bottom of the eighth. Green laced a two-out single to left-center and pinch-hitter Collin Mahoney was hit by a pitch. The runners moved up a base when Davis balked, but he struck out Evans to end the frame. The Buckeyes added three insurance runs in the ninth inning. Rabin blooped another single to leadoff the inning and advanced to second on a wild pitch. Snavely moved Rabin to third on a groundout to second and Rabin scored when Caravati singled against a drawn-in infield. Paul Farinacci then hit a ball to third base. McCann threw high to second base, as the umpire ruled the runner safe, even though the televsion replay clearly showed the runner never reached the bag until well-after the play was over (Slevin was blocking the bag). Two batters later, Derek Kinnear lined a sacrifice fly to center. Garrard then followed with a soft-single through the left side to give Ohio State a four-run lead. Clemson mounted another rally in the ninth. Triplett led off with a walk and McCann reached on a throwing error by Stephen at third. After Slevin reached on an infield single, second-baseman Anderson booted a potential game-ending double play at second to load the bases for the Tigers with one out. But Davis struck out Roberto Valiente and Mahoney looking to end the game. Clemson will play Princeton Saturday at 12:30 PM EDT in an elimination game. Clemson, who will be the visiting team and occupy the first-base dugout, must win four games in two days to advance to a Super Regional.